This past weekend while the weather was looking pretty close to awesome we re-made the roof window on my greenhouse shed. The first attempt was leaking in a couple small spots which prompted me to re-think the whole design before the project was too far along. I found out while I was removing the first attempt that if I had just caulked underneath two of the clamps I used to hold the windows in place everything would have been fine! Two small spots created a drip which seeped along the window and made contact with the plywood roofing underneath. It wasn't a good situation for the plywood but a little extra silicone in two spots would have done the trick. Still, I think I came up with a better solution in the end. 2 -12 foot long pieces of composite decking. 5 1/4" width. 6" wide pieces of pond liner. Using the composite decking we created a frame and screwed it through the roofing into the rafters below. We cut the top piece of decking and placed it at the top. Before we screwed it in we put the pond liner underneath the top layer of shingles and the decking. Along the pond liner I crimped it to the height of the decking to create ridge for water to run along and away from the window. Then we fit the side pieces and the bottom piece of decking. Each piece had enough overhang to support the windows around the edges. To brace the bottom window while we were getting everything attached we placed two 1/2" wide slivers of composite decking. The slivers created a brace for the lower edge of the window that wouldn't be effected by water. In the center of the opening we put the 2"x2" flush with the side edges of the frame so that it could support the area where the two windows met. These need shimmed up slightly and again we used some small slivers of composite decking - I really like that stuff but it does cost a pretty penny! Fortunately with 2 twelve foot long pieces we had plenty for this part of the project. I can't imagine the cost that would go into building a whole deck from it - but it would last! In the previous installation we used makeshift clamps from some hard plastic molding that we reclaimed from an old door. We used a hacksaw and cut 3 inch pieces from the plastic piece, drilled screw holes in it, then clamped eight of them around the roof window. The last task was to caulk which I used some silicon caulking that was said to work well under the weather. It was a good days work but well worth it to ensure a leak free roof. Now it seems this week will provide a good test - rain's a' coming! Clever design, my friend -- I do believe you've got one of the nicest greenhouses I've ever seen. It must be a pleasure to spend time in there. Kudos! Love all those small panes. 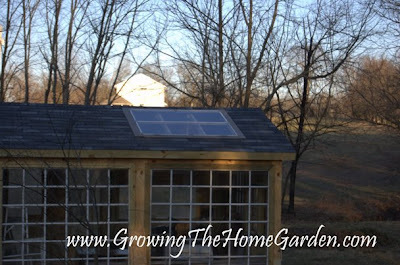 Great idea to use sliding glass windows for your greenhouse. My hubby is a contractor and gets these on sale or sometimes for free when doing a renovation. I showed him the pics of your greenhouse shed and hopefully it will get his creative juices flowing.... I've been wanting to put in a greenhouse for a long time. Glad you solved your leaky issue! I have heard that rainwater is good for plants though, hee hee, sorry could not resist that one. We are toying with a deck idea and we priced composite material. Ouch, that would hurt the wallet. Needless to say, we will be using wood for our project. Looks & sounds great to me Dave. It sure is a good looking shed. Be watchful, it will fill up quickly. I think that kind of window is important in a green house. It helps absorb light from the sun that the plants need.